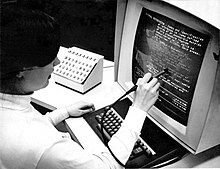 A light pen is a computer input device in the form of a light-sensitive wand used in conjunction with a computer's cathode-ray tube (CRT) display. A light pen detects changes of brightness of nearby screen pixels when scanned by cathode-ray tube electron beam and communicates the timing of this event to the computer. Since a CRT scans the entire screen one pixel at a time, the computer can keep track of the expected time of scanning various locations on screen by the beam and infer the pen's position from the latest timestamp. ^ For example, the Tandy 1000 SX has a DE-9 light pen conector on the rear panel; on the later-introduced Tandy 1000 TX, this light pen interface has been replaced with a serial port using the same connector in the same location. ^ "Slashphone Article". 2006-04-20. Archived from the original on 2008-11-20. Retrieved 2008-11-12. ^ "A Critical History of Computer Graphics and Animation". Retrieved 2009-05-04. ^ "The Computer Desktop Encyclopedia (entry for Light Pen)". Retrieved 2009-05-04. This page was last edited on 14 February 2019, at 22:15 (UTC).